Johnathan Skardon has been helping homeowners and businesses solve water problems since 1996. Mr. Skardon takes a problem solving approach to his work: understanding the issues and bringing solutions to the forefront so that problems can be solved once-and-for-all. In addition to helping solve gutter and water issues, Mr. Skardon enjoys writing, spending time with his kids, and chasing his Golden Doodle, Murphy, around the neighborhood. No matter the time of year, if you haven’t climbed a ladder to peek inside your gutters recently, odds are your gutters are due for a cleaning. 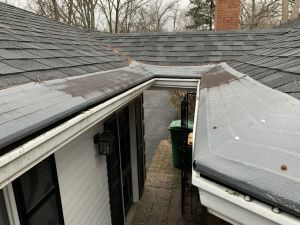 While gutter cleaning is likely low on your list of enjoyable weekend activities, this article highlights several reasons why this unpopular seasonal chore is vital for the well-being of a healthy home. Gutters are the primary mechanism for moving water off a roof and away from a home’s foundation. This may not seem like a big deal, but one inch of rain washing off the roof of a typical 2,000 square foot home can account for as much as 1,200 gallons of water. Based on the average rainfall for the Midwest, that adds up to nearly 32,000 gallons of water per year – enough water to fill 2 average sized swimming pools! The #1 cause of flooded basements and foundation damage is clogged gutters. 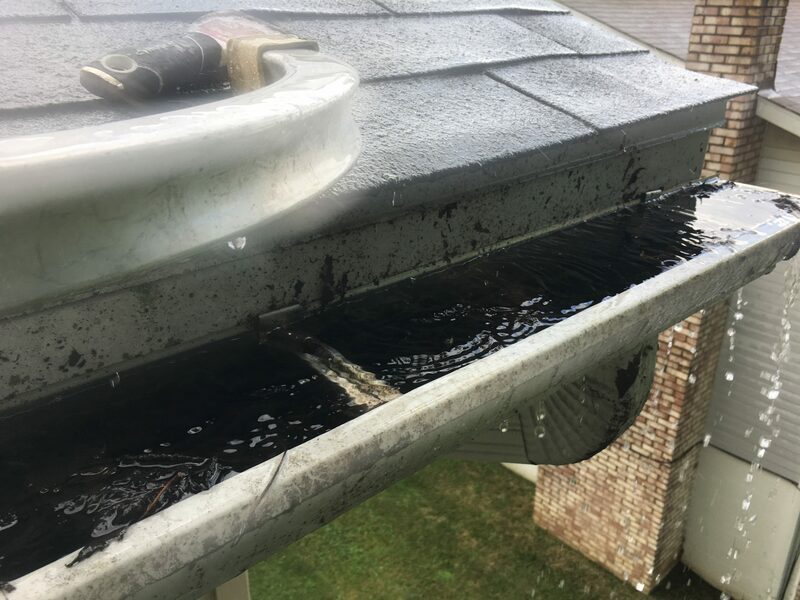 When gutters clog, water is unable to flow freely, which results in the gutters filling with water and cascading over the front and back edges of the gutter. Overflowing water will stream down a home’s exterior walls and seep into the ground below. If your home has a basement or crawl space, the water will find naturally occurring cracks in the foundation and enter the structure. If you have window wells, water can accumulate in the wells and seep through the window openings or broken seals around the window frames. As the ground becomes saturated, excess water will pool around the foundation until the ground can absorb it. The presence of excessive moisture around a foundation can lead to mold and mildew problems, which is costly to remediate, potentially hazardous to your home and health, and can adversely affect your home’s resale value. If left unchecked, clogged gutters can cause wood rot on your home’s fascia boards, soffits and eaves. When this occurs, gutters must be removed from your home so the damaged wood can be replaced. Clogged gutters are also a popular breeding ground for mosquitoes! 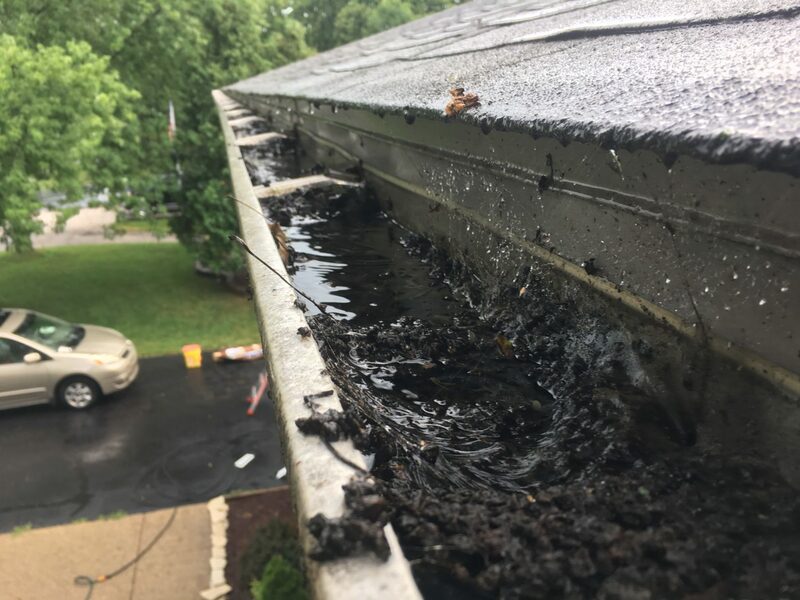 The simple way to avoid these problems is gutter cleaning on a regular basis or installing gutter guards that will permanently keep leaves and debris out of your gutters. Each homeowner will have a different gutter cleaning schedule based on the number and type of trees, and proximity of the trees to the house. In some cases, you may have to clean your gutters monthly, while other homeowners only have to do it a few times a year. 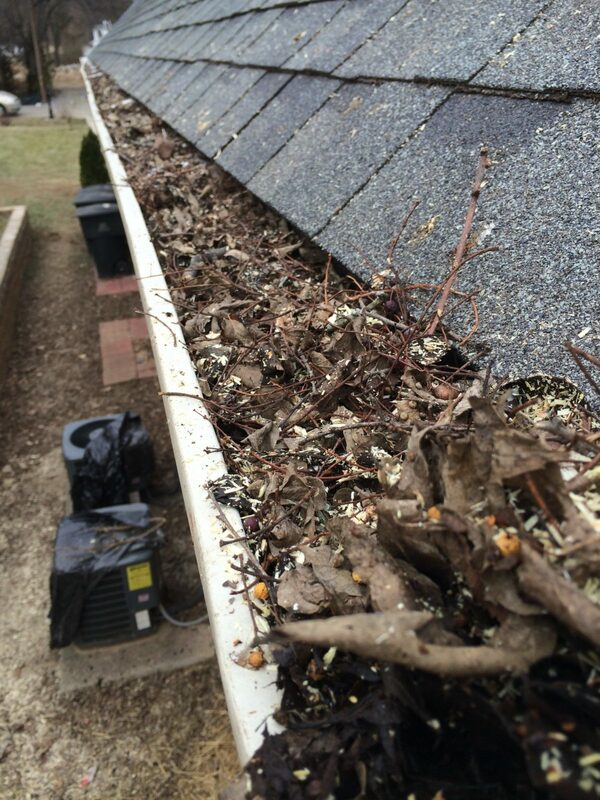 The easiest way to see if your gutters are clogged is to visually inspect them and watch what happens when it rains. If you see water spilling over the gutters, then you know they are clogged and you need to take action. Check the gutters seasonally to make sure they are flowing properly. The two most important times to check and clean gutters are during the spring and fall. As trees and shrubs blossom in the spring, they drop flowers, seeds, and other organic matter that can quickly build-up inside and clog your gutters. You may have to clean your gutters several times during the spring to keep them flowing properly. When leaves shed from trees in the fall, plan to clean the gutters again. It is very important that you clean your gutters before winter; otherwise, snow and ice is more likely to build-up in your gutters. Accumulating snow and ice can cause icicles to form on your gutters, and the excessive weight of the wet, compacted leaves and debris with the ice and snow can literally pull the gutters off of your home. Now that you are ready to clean your gutters, grab a step- or extension-ladder, a 3” paint scraper, a garden hose with a high-pressure nozzle, yard waste bags or a bucket in which to place the leaves (or drop them to the ground and pick them up later), and a pair of gardening gloves. If you are using an extension ladder, invest in a ladder stabilizer that will keep the ladder securely positioned on the side of your home and allow you to work freely without damaging the gutters. Following these easy steps will ensure that your gutters remain clog-free and work properly year round. Start at the downspout by first removing any leaves and debris that are covering the downspout opening. This will allow any standing water that may be in the gutter to drain out of the gutter. If there is a lot of standing water in the gutter, keep your hand inside the gutter, scooping out any debris that moves with the water towards the downspout. Clean out leaves and debris with your hand, a gutter scooper or leaf blower. Wearing gloves will protect your hands from scrapes and any sharp objects, such as sticks, pine needles and random roofing nails. Use a 3” paint scraper to remove smaller debris and shingle granules along the bottom of the gutter. A paint scraper fits nicely in the bottom of the gutter; it makes gutter cleaning easier by extending your reach and the scraper dislodges the toughest debris from the gutter surface. When you’re finished, your ladder will be positioned at the high side of the gutter. If you have downspouts on both ends of the gutter, the high spot will be in the center of the gutter, so start there and move towards both ends. Grab your hose with a hi-pressure nozzle, turn the faucet to the highest setting and wash out the gutters working towards the downspout. Once you reach the downspout, make sure that you have removed any remaining debris from the mouth of the downspout and shoot water down the downspout to ensure that debris is not restricting water flow. If the downspout is clogged, you may need to disconnect it in order to remove the debris. If you have underground drainage, be sure all debris has been removed from the downspout and the openings to the underground pipes are clear. Once your gutters are clean, if you still have standing water in the gutter, this means that your gutters were not installed improperly or have sagged over time. 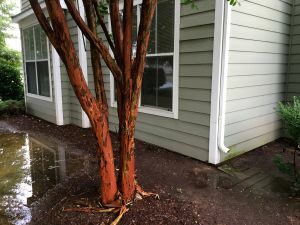 Unfortunately, this is a common problem that, if not corrected, will exacerbate water issues, so it’s something that you’ll want to take care of by hiring a professional to fix or replace your gutters. Check out five questions to ask before hiring a gutter contractor. Before scaling the side of our home to clean your gutters, keep in mind that according to the U.S. Centers for Disease Control and Prevention, 150,000 people are injured as a result of falling off of ladders and more than 150 people are killed annually. If you’re not inclined to clean your own gutters, hire a handyman or an enterprising high school/college student to do it for you. But be careful, if somebody gets injured while working on your home and is not properly insured, you may be liable for any injuries and damages that occur. If hiring a professional seems like the more prudent way to keep your gutters clean, set-up an annual maintenance contract or consider installing gutter guards as an alternative to regular cleanings. Not all gutter guards work effectively, so it is important to select the correct style of gutter guard for your home. The quantity and types of trees in your yard, your roof’s slope, and shingle style will determine the application that is best for you. Price will undoubtedly play a factor, too. With so many products on the market, use the Internet to do your homework, visit our blog at www.GutterTalkBlog.com for lots of useful information, check online reviews, ask for references, and then select the solution that is best for you. Regular gutter cleaning or installing gutter guards will keep your gutters clog-free, prevent costly damage to your home’s exterior and interior, and increase your home’s resale value. To learn more about how Gutter Guards Direct can help with gutter cleaning and gutter guards, call us toll-free at 1-800-750-2131 or complete and submit the inquiry form below. Please complete the following form and a representative will contact you to schedule a consultation. Leaky basement? 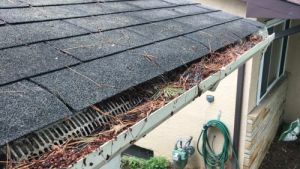 8 reasons why your gutters are the likely culprit! I like that you mention how having standing water is a sign of improper installation and how it’s important to hire a professional to fix or replace them. You could even hire a professional to handle the gutter cleaning so that the best methods and equipment are used and to have them check for any issues at the same time. It might help to consider how often you should have gutter cleaning done in order to make sure you can find problems early on and to ensure they’ll work to help you protect your home.